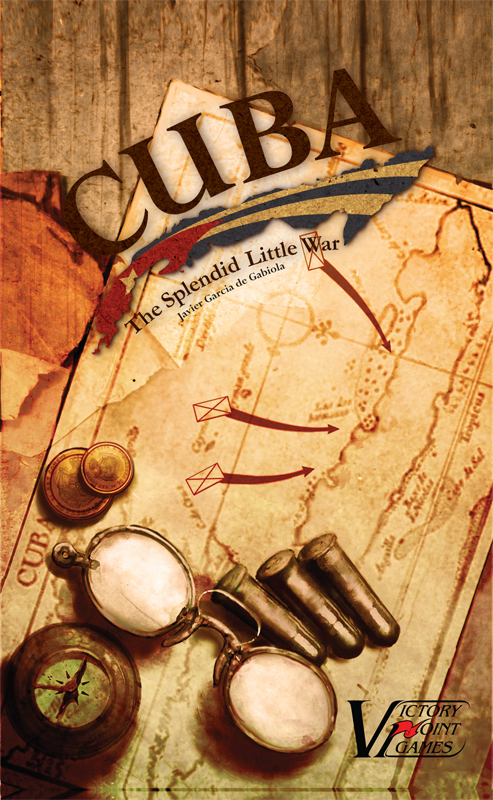 This game is strictly a two-player simulation of the third War of Cuban Independence. 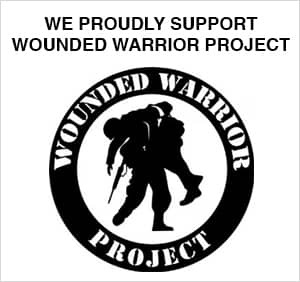 One player controls the Cuban Guerrilla forces, and the U.S. forces once the U.S. declares WAR! 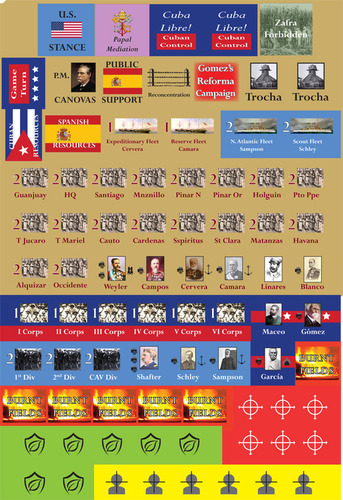 The other player controls the Spanish forces. Victory Point Games claims some solo play value, but as a reviewer the only solo value I found was in reading the historical notes on the cards and the designers notes. 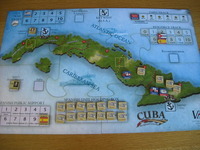 I admit that I knew precious little about the third Cuban war of independence when I was handed this game to review. So I eagerly dove into the designer’s notes on the flyleaf of the rulebook. The war is described as “a bloody guerrilla war that Spain nearly won.” The statement reeks of exciting war game potential, bloody and balanced! The well written and organized designer’s notes do an excellent job of introducing both the time period, and the conflict. The rules themselves are numbered in typical war game fashion, but are also color coded, and highlighted. This is a good presentation concept… for everyone except those who are challenged with color blindness, but it does not preclude such persons use of the game. The box set I was provided contained two, one-sided maps, one being un-mounted, the other map was mounted on MDF like cardboard, and key cut to allow it to be easily assembled and remain together for game play, a nice touch. Both maps are clearly, and attractively printed, but have a semi-gloss finish that will prove difficult to read under many lighting conditions. The Game Equipment list in the rules calls for 4, 6-sided dice. None will be provided for the poly bag game package offering. My box game contained only 1 6-sided die, and the outside description of contents also calls for 1 Die. The call for 4D6, is an obvious type-o. Further examination of the game reveled no real need for additional dice. 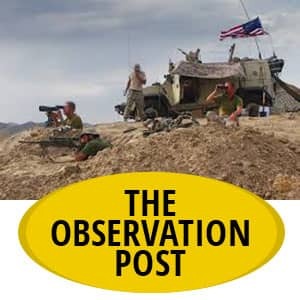 An American Intervention card named Torpedo Attack requires adding 2D6 to an attack, as do some modified searches, etc., but there is no reason these instances cannot be addressed by rolling the 1D6 provided, repeatedly. 75 game cards are provided. Mine were in a pack of 50 and a pack of 25. They breakdown as 67 action cards (some of which have BLUE highlighting and apply only to American intervention), 7 history cards, and one set up card. I found them scattered between the two packages of cards, so go right ahead and open both card packs and sort them out when you un-box your copy. A few, too few, poly bags are provided for card and game piece storage. Information and unit counters are clearly printed on the same MDF like cardboard material as the one mounted map, though my copy of the counters was printed slightly right of center, no information was lost, and they are quite playable. 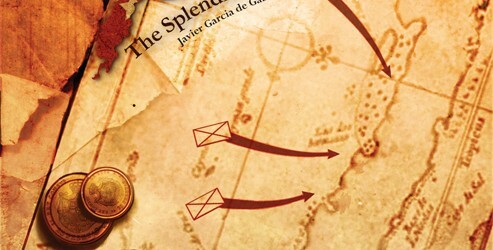 The Spanish unit counters are two-sided and are printed with a lighter shade background on the reduced strength side. For me, the lighter shade does not work as well as a white or red stripe used in other games, but with Spanish unit strength being printed in large font, and being either 2 or 1, the color shade approach is of little consequence. 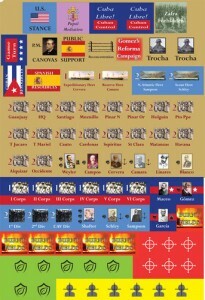 American unit counters use the same shading approach in blue, but the shading technique is not applied to the Cuban unit markers. Leader Counters display special icons to the left and right of the Leaders portrait. These icons bestow special abilities such as searching, siege, adding resources, and combat DRM. Time to punch the counters. The counters are laser cut, and Victory Point Games includes a Wipes-A-Lot (cocktail napkin) to assist in removing any ash residue, and two moisture/odor absorbing packets. I thought this to be quite a tongue-in-cheek response to gamer buzz about unit-counter, laser cutting ash and burned smell, and the Wipes-A-Lot tickled my funny bone, but my laughter was short lived. I found no ash, and no odor. The unit counters share common sides, and were easy to remove. Other counters more isolated on the sheet (e.g. Burnt Fields markers) were quite fiddly to remove and great care had to be exercised to ensure that they did not rip during the punching-out process. The small nibs left to secure the edges of these counters simply work too well. I retreated to my hobby room, and retrieved a chisel blade hobby knife to aid in the counter removal process. While on that foray I also retrieved a number of smaller poly bags to help keep the counters separated. Grab the deck of cards (minus the set-up and historical cards.) Remove the cards with Blue Header (these are for American intervention only), shuffle and deal out 6 each. Check. Set up the playing field as set out in the instruction booklet …eh, not so much. I found the use of the graphic provided on the Player Aid sheet very useful for setting up my first go-round. Play then enters rounds of alternating card play, with the usual allowance of REACTION CARDS to cancel the other player’s card, or introduce a DRM, etc.. Rather unique is the Discarding process. With both players dealt from the same deck it is natural for one player to find he holds in his hand a number of cards advantageous to his adversary. The owning player can discard three cards from his or her hand, and receive 1 Resource point for immediate use in play, unique, I like it. As is commonly the case in our hobby, Resource points will ebb and flow as the game plays out, and Resource points are the energy that allows you to take action. The turn continues until both players PASS consecutively. Play then enters the ADMINISTRATIVE PHASE, where you determine victory, check the status of U.S. involvement, then, interestingly, discard all the players remaining cards, if any, or players may keep cards in their hand for the next turn at a cost of 1 RESOURCE POINT each, another pleasing touch. Players calculate income, reshuffle the discard pile (minus the cards with underlined headings that are removed for the rest of the game after being played) and remaining draw deck back together. Hands are then refilled to the level indicated by the player’s current resource level. Players then perform some housekeeping before advancing the turn marker and going at it once again. Before attacking a Cuban unit it must be located. After all, the Cuban units are guerilla units, and pinning them down is the hard part. The process laid out in the rules is logical, but In My Humble Opinion, overly complicated, but I got over it and acquiesced to the greater period knowledge of the game developers. I did however once again find that it is much easier to follow the Search and Combat Modifiers listings on the Player Aid sheet, than reading the process in the rules. My initial reaction is that this is an interesting game with some innovative mechanics. The management of resources is immediately obvious as a key element of the game. When we took this game for a spin it became immediately obvious that the cards possess momentum-changing power, and yet they are so dependent on the current game situation, itself a circumstance of previous game and card play, that those earth-shattering cards all too often have no power at all. We also found that it was too easy for the Spanish to raise units, and for the poor Cubans, their popular uprising guerilla war, proved not to be all that popular. It was quite difficult for the Cubans to raise troops, compared to the Spanish. Perhaps a tweak of allowing the Cubans to spend additional resources to guarantee troops joining the cause of freedom would fix that weakness, but suggesting tweaks isn’t my job here. 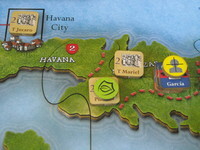 The circumstance of the deck shuffle, and a bit of bad dice rolling by my Cuban adversary, lead to the U.S. coming in on turn three, but the Cubans had already been crushed into the dust. It is a very interesting game, with a tremendous amount of replay potential given the randomness of card impact, but that same randomness will make playing a game that is balanced a rarity, that balance being overly dependent on the luck of the shuffle.